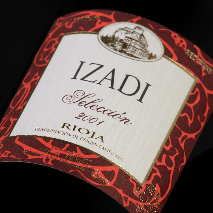 Rioja, Seleccion, Vina Izadi 1997 wine. Founded in 1987 by Gonzalo Anton as a breakaway from the traditional style of wine produced by other members of his family. Rioja, Seleccion, Vina Izadi 1997, Fine tannins, purity of fruit, multiple layers of flavours, drinking beautifully.& This estate owns its own vineyards and has long-term contracts with other growers in the Rioja Alavesa on calcareous soils around the town of Villabuena. Founded in 1987 by Gonzalo Anton as a breakaway from the traditional style of wine produced by other members of his family.